Over the last couple of years, as we have continued to see different variations of phones arrive in different parts of the world depending on the types of networks involved, one almost always immediately goes to, “Well, this chipset must not support LTE,” as the difference maker. A similar sentiment arose after Samsung announced the Galaxy S4 and the fact that the U.S. in particular would receive a variant sporting a Snapdragon 600 processor instead of their own Exynos 5 Octa. With Qualcomm leading the mobile processor and modem charge when it comes to LTE, it was easy to buy into this idea. According to SamMobile, that is most definitely not the case this time around, though. 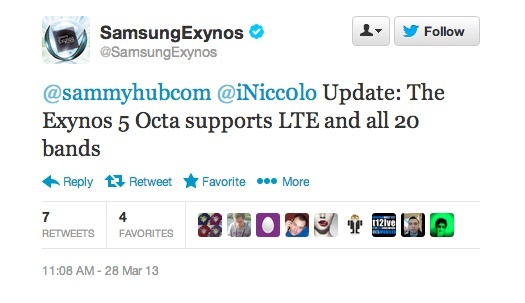 The official Samsung Exynos Twitter account confirmed to them today that the Exynos 5 Octa actually supports all 20 global LTE bands. And truthfully, this shouldn’t surprise anyone, as the Galaxy Note 2 launched at the end of last year with an Exynos chipset and had no issue connecting to U.S. LTE networks. So why the Snapdragon 600 then? It likely has to do with volume, and the fact that Samsung may not have been able to make enough Octa processors in time to meet their April launch. With Qualcomm pumping out Snapdragon processors by the minute, I’m sure they were more than willing to offer up their support to one of the biggest smartphone manufacturers in the world. At this point in the game, does it matter to you all that much when it comes to processor manufacturer? The Snapdragon line has dominated the last couple of years, but do you actively choose handsets depending on processor or are they all powerful enough at this point?